Burrito Wraps. Is that redundant? A tortilla added to a cheeseburger is like an added bonus. And who doesn’t love added bonuses? Not me! I know, I know, I know, I know I just posted a cheeseburger recipe. What can I say, I have really been grooving on cheeseburgers this summer? While I love the ritual of grilling some nights there isn’t enough time. Sure I could get a fast food cheeseburger but I am trying to keep my Culver’s trips to a minimum. The month of September I am pledging to not eat fast food as a convenient way to get dinner on the table. Join me! Sign up for my email newsletter (sign up on my right side bar) and get tips and recipe ideas to help you get through the month. In order to keep those fast food trips from becoming a temptation I need to have an arsenal of quick dinner recipes on hand. 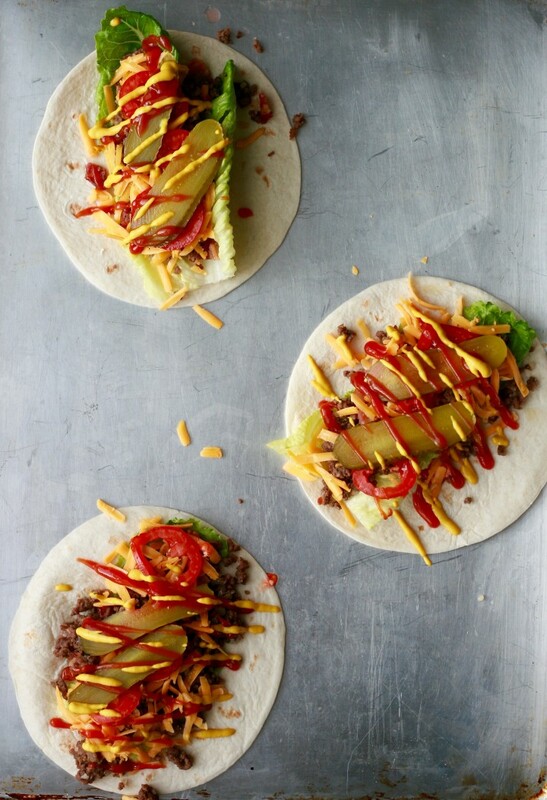 Cheeseburger Burrito Wraps give you all the flavor of a cheeseburger but cook up in ten minutes. TEN MINUTES is faster than it takes to get through the drive-thru. These burrito wraps needed to be different from a taco. I think what really set them apart from a taco was the addition of precooked bacon and thinly sliced dill pickles. Those two combined with the browned ground beef definitely said CHEESEBURGER. My kids loved these. 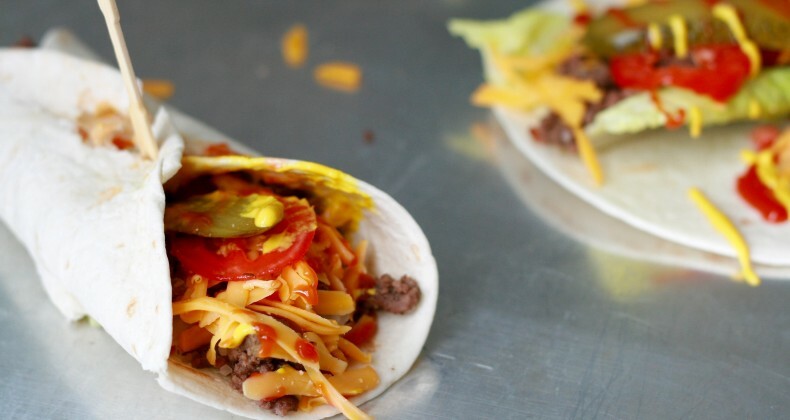 tl;dr All the flavors of a cheeseburger jammed into a tortilla and ready in 10 minutes. Winner! It really doesn’t get any easier than this! I have a similar recipe and my kids absolutely love it! I also add avocado. And yes, it does take only a few minutes to make and it’s a lot faster than ordering take out. Avocado would be a great addition! I could see doing a ground turkey burger version with avocado slices. Mmmm! Oh a flavored tortilla is a GREAT idea! I really should do the “no eating out” in September. We have been so busy lately I haven’t wanted to be in the kitchen (other than canning) and our diets have suffered. Need a boost to get back on track, we may join you! You = genius. You even did a pickle, you are winning my heart! Well the whole no fast food thing isn’t going too well this month. 😉 Going to give it a stern go next month!